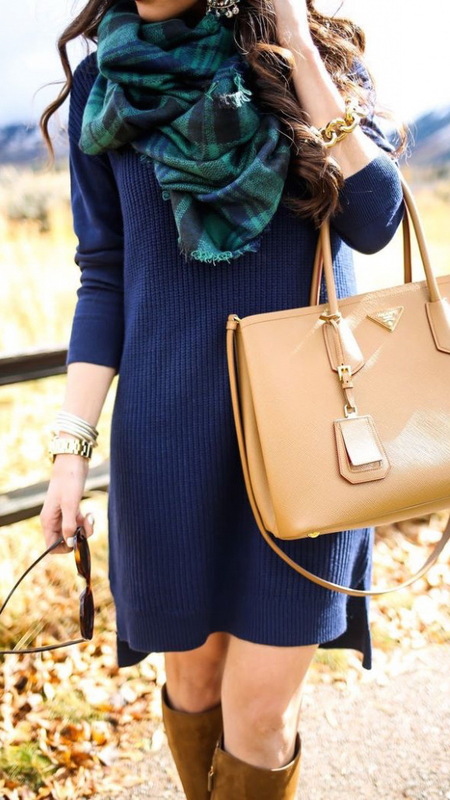 Sweater dress comes with a casual appearance, but you can make it look stylish and modern. Keep things simple, by wearing this dress on its own, just adding a pair of heels or boots. It does looks great with leggings or tights. You can either go for neutral color tights to achieve a feminine appearance, or keep it cool and funky-looking with shiny metallic leggings. Don’t be afraid of adding a belt. It will underline your beautiful silhouette and make you look feminine. The last but not least, don’t forget about layers. Think of scarves, jackets, coats and shawls. Scroll down to see my favorite ideas to get inspired right now.